As I thought about the various items that I had selected for my menu, there was no question in my mind about which should come first: The Egg, as served by David Kinch at Manresa. The components of this dish are few and the preparation is relatively straightforward: an egg yolk that has been soft-boiled in its shell is topped with minced fresh chives, sherry vinegar whipped cream, sea salt, black pepper, and maple syrup. Yet, despite this simplicity, the flavor combination is truly tantalizing, and the serving size is just small enough to leave the diner craving more. In other words, it's a perfect selection for whetting the appetite, which probably explains why Kinch serves it as an amuse bouche to every table at the restaurant. Now, some might legitimately ask whether The Egg is a good choice to represent David Kinch on my menu. After all, the dish was created by chef Alain Passard at L'Arpege in Paris, and Kinch merely replicated it for service in his Los Gatos restaurant. But after giving this some thought, I concluded that the provenance of The Egg was of little import. What mattered to me was that Kinch recognized its appeal, he figured out a way to incorporate it seamlessly and prominently in his cuisine, and he has managed to introduce thousands of Bay Area diners to a spectacular appetizer that many would never have experienced otherwise. And as one prominent food blogger has noted, Kinch provides full attribution for the dish whenever he is asked - so it's not as though he's trying to pass it off as his own creation. Finally, all cooking is ultimately comprised - to one degree or another - of ingredients, combinations and techniques that are already known, so trying to limit my menu to purely original creations from the four-star chefs would be an exercise in futility. It didn't take much effort to find a recipe for The Egg online, but a few of the instructions set forth there seemed to be potentially problematic. First, the original recipe suggests cutting off the top of each egg with an egg topper, and then pouring out the white while keeping the yolk in the shell using the flat side of a knife. This technique, however, seems to leave behind some of the white, and that can adversely impact both the taste and consistency of the egg after it has been soft-boiled. To avoid this, I poured the entire contents of my decapped egg into an egg separator, rinsed out the inside of the shell, and then returned only the yolk to its shell. Second, the original recipe suggests soft-boiling the decapped eggs by placing them in a single layer in a large shallow skillet with 2 inches of simmering water. This struck me as a rather precarious arrangement, the risk being that one or more of the eggs will tip over and take in some water. Here, a friend of mine came to the rescue, as she had just purchased a small appliance made by Salton specifically for boiling and poaching eggs. While I'm not sure that this device offers any significant advantage over a simple pot of water when it comes to cooking whole eggs, it's perfect for cooking decapped ones due to its integrated egg holder. 3. 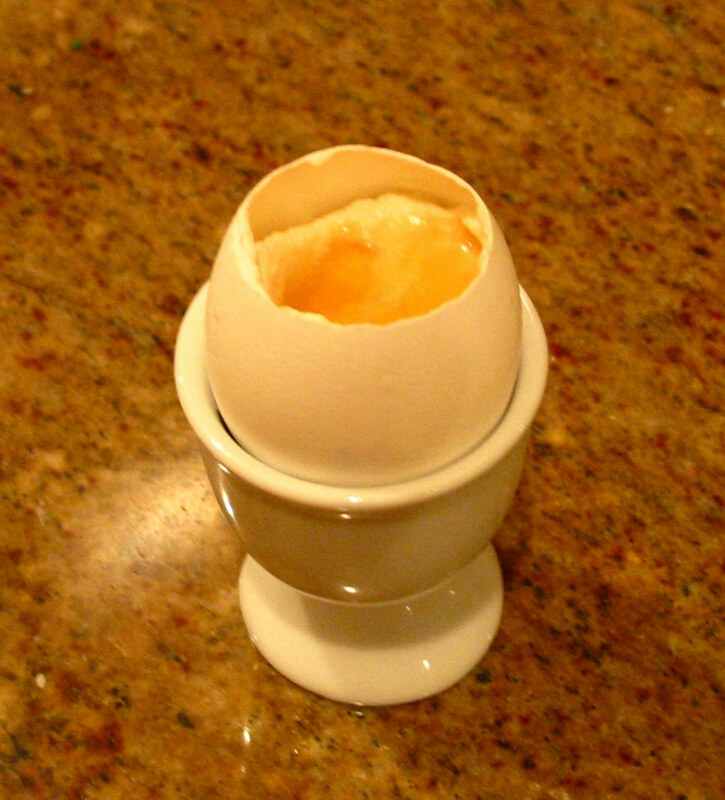 Place water in Salton Egg Poacher (or similar device), following the manufacturer's instructions for soft-boiling eggs. Place 6 eggs in the device and turn on. Cook eggs until yolks just start to set around the edges - approximately two minutes. Remove eggs from device and return to egg cups. 4. Place water and remaining 6 eggs in Salton Egg Poacher (or similar device) and turn on. 5. While the second batch of eggs is cooking, sprinkle each of the cooked yolks from the first batch with minced chives, and then season to taste with freshly ground black pepper and sea salt. Spoon sherry vinegar whipped cream into each shell, filling to a level approximating the edge of the egg cup. Drizzle with maple syrup. 6. Repeat step 5 for the second batch of 6 eggs after they have finished cooking. Serve immediately. That's more than just one mere bay area food blogger - that's his girlfriend!!! Sam: Yes, indeed, but I figured I would leave that little tidbit for others to discover on their own! It was really cute to go back and reread the story of before/when they first met, so thank you for the reminder. Chef Kinch's rendition of The Egg is indeed as tantalizing and utterly delicious as you describe, though it had never occurred to me to make it at home, so thank you for the inspiration! I inherited an ancient egg cooker some time ago and love it almost as much as my Hobbes kettle, as these two devices let me leave the kitchen in the morning and come back to tea and perfect soft-boiled eggs without having to worry too much about timing. Olivia: Thanks for stopping by, and thanks for the kind words! It sounds like your "ancient egg cooker" might be the perfect tool for whipping up a batch of The Arpege/Kinch Egg - please let me know how it goes!